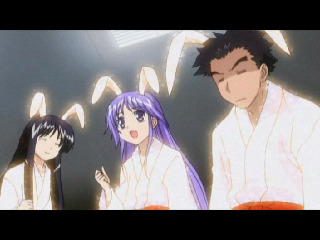 Another Ibuki episode, but much more entertaining than last week’s. Actually, this was quite hysterical at points. While I can’t understand why anyone would make an effort to become friends with her, they do anyway by visiting an arcade (in which Ibuki shows her failure at every sort of game,) by going bowling (in which Ibuki also fails miserably) and by taking cosplay photoshoots. Despite being obnoxious even for a tsundere, Ibuki is becoming a very entertaining character. She’s actually worse at bowling than I am. 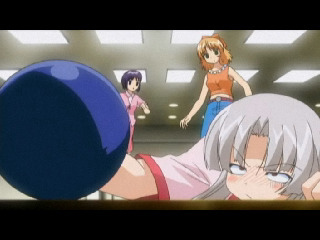 The bowling sequence was the funniest part, especially with Tama-chan. 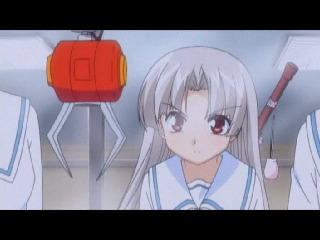 I also liked how Ibuki tried to destroy the UFO catcher machine in the arcade. Just because I’m getting more attached to her, doesn’t mean Jun gets replaced. Please let him do something, oh staff of this show. 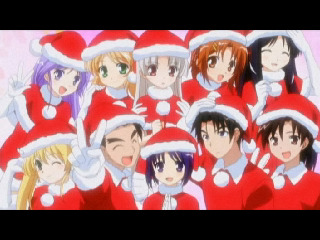 Next week doesn’t seem to be about anyone in particular (maybe Haruhi) but the previews for this show are pretty vague. It’s a beach episode with weird looking CG water. Because prematurely gray loli’s are teh hotness? @Baka-Kun and Heyman- Good theories. Probably the only reasons. The harem one seems likely. @Danny- Smae with me. It wasn’t amazing, but at least it wasn’t painful to watch like the previous one.